The "CHARMING 2 BEDROOM apartment" is situated in the most exclusive area of Ibiza Town: in Marina Botafoch, on Paseo Maritimo (Passeig Joan Carles I), a fantastic and safe location by the sea with everything close by, but at the same time it's also a quiet area: Talamanca Beach, super markets, shops, great restaurants (such as Cipriani, Heart, Sushi Point, Trattoria de Mar), cafès, Ibiza Gran Hotel Spa and Casino, Pacha Club and Lio, are all within short walking distance but far enough not to hear the noise. And it's only about 15 minutes walking to Ibiza Old Town and Dalt Vila (or 2 minutes by taxi, ferry or car). The taxi rank is on the next block. Also the ferry dock is only 5 minutes walking. The fully furnished apartment is composed of: 2 double bedrooms - one of them ensuite - (on request, beds can be made twins, instead of double, in one of the bedrooms), 2 bathrooms (one with bathtub and the other with shower) , a large living/dining room with a comfortable sofabed for 2 people, an open and fully equipped kitchen, and a terrace with partial/side view on Ibiza Old Town equipped with table and chairs where you can enjoy your meals "al fresco" and relax. Air conditioning, free Wifi, Flat TV, stereo Hi-Fi, , I Pod player, safe, washing-machine, clothes dryer, dishwasher, Nespresso and regular Coffee machine, microwave, toaster, blender, kettle, hair dryer and 2 communal swimming pools. The apartment is only a 10-15 min taxi ride from the airport and as everything is close by (including a taxi stand) , no car hire is necessary. However, if you plan to hire a car, FREE OF CHARGE PARKING SPACES ARE ON THE STREET near the Building or, if you prefer, you may rent a parking space in the garage of the complex, on request. Please, kindly note that our apartment has VERY COMPETITIVE PRICES compared to similar apartments in the same area or complex, which are rented per day, since our minimum stay is 30 nights. This apartment is rented in accordance with the Spanish Law called "LAU" and no hotel/tourist services, such as breakfast or daily housekeeping, are offered. Parking Spaces, free of charge on the street near the Building. 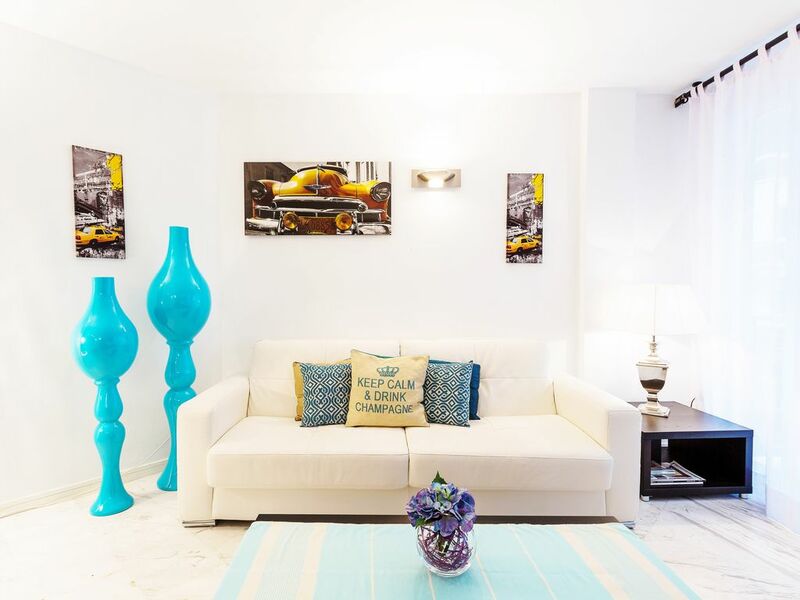 The apartment is situated in the most exclusive area of Ibiza Town: Marina Botafoch, on Paseo Maritimo (Passeig Joan Carles), a fantastic and safe location by the sea with everything close by, but at the same time it's also a quiet area: Talamanca Beach, Great restaurants (such as Cipriani, Sushi Point, Trattoria de Mar), cafès, mini & supermarket, shops, Ibiza Gran Hotel Spa and Casino, Pacha and Lio are all within short walkable distance although no noise! Also the new faboulos marina area with the most beautiful yachts and other great bars and restaurants and luxury shops, is at only 200 meters,. And it's only about 15 minutes walking to Ibiza Old Town and Dalt Vila (or 2 minutes by taxi, ferry or car). The taxi stand is next block. Also the ferry dock is at only 5 minutes walking.